My name is Patti Itzin. I have been coaching the sport of figure skating since 1997. Currently I teach at the Brooklyn Park Ice Arena and Maple Grove Ice Arena in the great state of Minnesota. I am on the professional staff of the Three Rivers Figure Skating Club and a current Category A coaching member of US Figure Skating. As a member of the Professional Figure Skaters Association (PSA) I am rated as a Master Moves in the Field Instructor, Registered Freestyle Instructor, and Certified Group Instructor. My website is full of information on private lessons as well as other skating information. Please click on the links on the top for more information. Private lessons are one-on-one skating instruction with a professional skating coach. They provide individualized attention for skaters looking to learn the basics, improve the skills they are currently learning, or to take their skating to the next level. Who can benefit from private lessons? Everyone! Private lessons can help young skaters gain confidence on their skates, older skaters can learn the basic skills to build a foundation for advanced skills, advanced skaters can reach their goals and dreams, adults can learn basic skills to keep up with their kids or even to be skaters themselves! When is my skater, or myself, ready for private lessons? 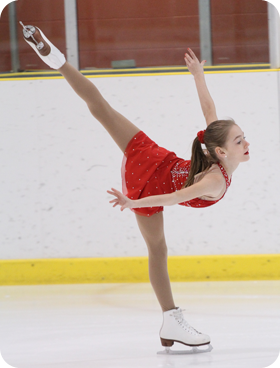 Skaters are ready for private lessons when they feel they want more practice or individualized instruction than what is available in a group class setting. Private lessons may also be useful for skaters whose schedule doesn't allow time for group lessons, but still wants to learn how to skate. If you are interested in skating lessons please contact me!